Hoodsport n dive - Tumwater store or Hoodsport store. Waymire isn't an instructor, he's a DM, and having worked at Sound Dive Center for four years all I ll say is you'd better have deep pockets and not much concern for teaching to standards if you're interested in getting certified there. Mike Waymire and Bret at Sound Dive Center in Bremerton! Caution: don't dish it out to Bret if you can't take it! A couple of good guys with more collective time underwater than the Ranger. 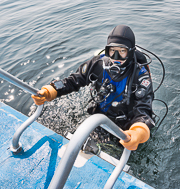 Basic open water and dry suit courses every month and a rescue diver course starting July 23rd. Don't tempt me with a good time. I may just take you up on that offer. 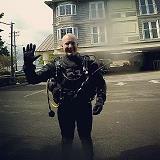 I took my open water class from Silent World in Bellevue last July. It was great! Cory Newman is the nicest guy and even sings to you during your open water class, some of my favorite surface swim memories! Getting certified was the best thing I ever did! I got to meet some great friends in class and also from hanging out in the shop. He even lets you know who the other Trekkies are in class. I hope your friend has a great experience wherever they end up going. 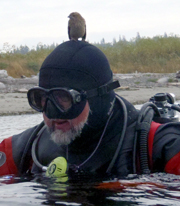 I did my OW certification in March with Chad Kent at Evergreen Dive Services in Everett. I was very satisfied with his instruction, he was patient, knowledgeable and left me with no question unanswered. I look forward to doing other classes with him and his shop in the future to further my level of knowledge and training. I'd recommend Casey Offord, who is teaching through Fifth Dimension. Casey worked with me for a few years, helping with OW, AOW and Rescue classes, and does a fantastic job. He and Peter are the instructors I now refer people to when they inquire with me about those classes I no longer teach. I know it sounds self-serving, but I think my husband does a very good job of his classes. We teach with the "early transition to neutral buoyancy" approach (no "on the knees") and emphasize good buoyancy control, trim, and buddy awareness. Peter teaches more gas management than is required, especially in his Nitrox class. We've gotten a lot of good feedback from students, and referrals of friends. 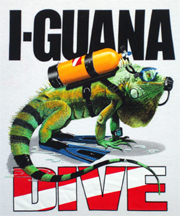 Plus, a fair number of our students have remained active divers, which I think is the real acid test. Penopolypants wrote: ...he is not teaching OW, he's limiting it to sidemount, photography, workshops, etc. You are correct Pen... I totally missed that.. thought it included OW. It's true, but he is not teaching OW, he's limiting it to sidemount, photography, workshops, etc. Tangfish wrote: Bob is on sabbatical..
Oh really? That's news to me. KneeDeep wrote: Bob B... enough said. Bob is on sabbatical, he was my go-to recommendation for years. If we are strictly talking open water only I'd say Fred of Argonaut diving (ton of DM and AI support) or Peter through Bubbles Below (tech friendly perspective) would be who I would send my kids to. Last edited by Jeremy on Sat Jun 13, 2015 7:47 am, edited 1 time in total. C'mon folks, I know that there are some good instructors in our ranks! I get asked all the time about Open Water instruction, by people from all over the PNW. I didn't do my training here locally and it was also a long time ago, so you could say that I'm "out of the loop". Would any of you more recently certified OW/AOW/Rescue divers please offer a recommendation, based on your own personal experience, please? *please don't bash the person or shop here if you didn't like your course, I'm looking specifically for positive recommendations. IF you feel compelled to let me know about a negative experience please do it through PM as I don't want this to turn into a wall of shame thread. These prospective OW/AOW students and I thank you in advance for any recommendations!